Your family owning a trampoline was probably a fun highlight from your childhood. Now that you have a family of your own, you might want to give your children something they would enjoy in your backyard. While this activity can be a lot of fun, it causes around 100,000 injuries annually in the United States alone. These injuries can be prevented if your kids jump on a much safer trampoline. So how do you choose the best one for your children’s safety? In this post, we will go over the best-rated trampolines out on the market right now. We have provided you a rundown of our top 9 picks, as well as description of their best features, pros, and cons. We also have here information on what to look out for when choosing a good trampoline. We hope that after you have read this post, you will be confident enough to make an informed buying decision. Keep reading if you want to know more. Safety is the most important factor that should be considered when choosing a trampoline. Nowadays, it would be very uncommon to find a trampoline that does not come with a safety enclosure. However, it is now up to you to decide which one of the trampolines reviewed in the earlier section has the best safety features. Size is another major consideration when buying a trampoline. To be able to make this decision, consider how many people will be using it. If you have a large family, it would be wise to buy one that can accommodate more people. If you have a small family, on the other hand, it would also ideal for you to buy just a small one. Another tip is to consider the size of your backyard. If you have a small one, then it would not be advisable to buy a large trampoline. Round or oval trampolines are traditional, as it provides jumpers with a deeper yet softer bounce. However, if your child is a gymnast, it would be ideal for you to get a rectangular one instead. As with its size, you should also consider the shape and potential space for your trampoline in your backyard. As a consumer, you would want to buy a trampoline that is strong, stable, and long-lasting. Features including its construction, as well as other accessories such as the rain cover and ladder, are all very important when deciding what to buy. This is where you evaluate if the trampoline gives you a great value for the price you paid for it. The SkyBound Cirrus trampoline is an ASTM safety-certified trampoline that features a plush bounce, paired with a topnotch warranty that ensures that you and your family will be able to enjoy it for the years to come. It comes with a high-density and UV-resistant concave safety enclosure net will keep your kids inside it all while preventing contact with the enclosure poles. In addition, its thick and UV-resistant pad provides your kids with an extra layer of protection. What makes this SkyBound trampoline one of the best is that it has a patented easy-installation design, allowing you to assemble it in less than an hour. The manual comes with an easy-to-follow guide and you can always count on the US-based team of experts to help you if you are having difficulty with the installation. Another reason to consider this SkyBound trampoline is that it features a 14-foot wide steel frame that is also powder-coated in the exposed areas, preventing premature corrosion and rust. Combined with the brand’s 10-year warranty, this feature is very important, especially if you live in a humid and wet environment. 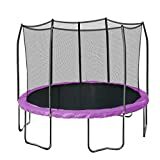 The Zupapa 15 14 12 series is a round-shaped TUV-approved trampoline, earning the top score ratings on Amazon. It earned its great reputation as one of the best trampolines in the world through the use of high-quality and high-standard parts and components. 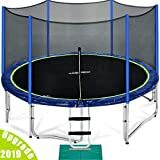 Compared to other trampolines on this review, it utilizes longer net poles, which are bungled tightly that makes it more firm and safer for all its users. It features a rust and corrosion-resistant heavy-duty steel frame, making it a lot sturdier and stronger than its alternatives. Another reason to consider choosing this Zupapa trampoline is that it comes with an additional 108 galvanized springs, allowing to it be comfortable, safe, and with super stretch capabilities. Its accessories include a safety pad, a ladder, an enclosure net, a rain cover, and a T-hook. The brand is dedicated to creating one of the best and safest trampolines for adults and kids. 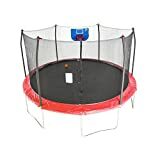 This improved 15-feet Jump N’ Dunk trampoline by Skywalker also features a soft basketball hoop that is safe for use by kids and for the whole family. Indeed, this trampoline would keep you and your family entertained for a long period. Another great feature of this trampoline is its No-Gap Enclosure technology, the reinforced frame from galvanized steel construction, the thick UV-resistant spring pad, 96 tightly coiled 6.5-inch springs, as well as a dual closure system. While being one of the newest trampolines on the market now, the Giantex trampoline already received a whole lot of positive reviews from consumers. It features a taller enclosure net and frame, allowing not only kids but also adults who love to play on the trampoline. To add, it can accommodate many people, allowing you and your family to enjoy it more. This trampoline features a rust-resistant galvanized steel frame and jumping mat, a solid and strong U-shaped leg base, a safe enclosure net with padded protective foam poles, as well as a complete accessory kit that makes assembly a lot easier for you. The Merax 14-feet round trampoline comes with a safety enclosure, a basketball hoop, and a heavy-duty 4-step steel ladder that makes it convenient for you and your kids. Its frame is constructed with galvanized rust-resistant steel, equipped with a total of six W-shaped legs that adds extra stability. Surely, this trampoline will be safe and enjoyable for you and your family. Another great reason to buy the Merax trampoline is that its maximum weight capacity is at 330 lbs. In addition, it comes with a high-quality UV-resistant safety enclosure that will protect you from the sun. What makes this a great buy is that the installation requires no complicated hardware. 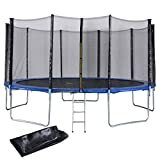 Yet another Skywalker product on this review is its 15-Feet Jump N’ Dunk trampoline, which is extremely safe because it comes with a safety enclosure net and pads. These features are very important, as it allows your kids to jump without you worrying about their safety. 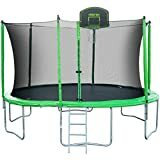 When you look at it, you will notice that it is a traditional trampoline that is equipped with pads, netting, and a safety zipper at the door. In addition to the safety features of the Skywalker 15-Feet trampoline, it also features a basketball hoop and ball, giving you and your family more hours of fun. The hoop comes in an easy-attach design and a breakaway rim, getting rid of the possibilities of limbs getting injured or stuck. It also has a dual enclosure system and foam pads, making sure that everyone inside is safe. Lastly, you surely will enjoy this trampoline with your family for a long period because its frame and springs are made of durable and rust-resistant galvanized steel. 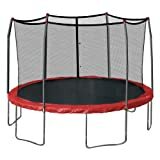 Another Skywalker trampoline on this review is the round-shaped 15-Feet Round trampoline, which of course is a great buy because of its quality and size. This trampoline is specifically designed to cater to an extended family, thanks to its sturdy anti-twist frame constructed from reinforced T-sockets and six W-shaped legs for extra stability. This Skywalker trampoline also features a stay-put enclosure netting interlocked to the mat without gaps, creating a more secure and uni-bodied construction. With its strong and weather-resistant materials, you should expect this trampoline to last for many years, keeping you and your family active and entertained. 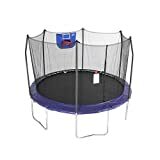 Unlike the round Skywalker trampolines on this review, this one comes in a rectangular design, along with the brand’s patented no-gap enclosure system, eliminating the hazard between the net and the jumping mat. Therefore, all limbs will be kept safe and out of harm’s way. It also features a padded enclosure system, containing eight upright foam-padded poles for added stability. Because of its rectangular shape, this Skywalker trampoline is one of the bounciest trampolines while providing an even bounce from both ends. This is an extremely important feature for gymnasts because there will be a superb bounce at any given area of this trampoline. In addition, this trampoline has been tested for durability and safety and has been certified by the ASTM. Overall, this is one of the best rectangular trampolines around the world. The last product on this review, which is the Skywalker 12-Feet round trampoline, features a reinforced T-bracket construction, providing greater stability at each joint and enclosure. As with the other Skywalker models on this review, this one also comes with the patented no-gap enclosure system and a tightly woven polyethylene enclosure net, which ensures UV protection, as well as durability. It also is equipped with 72 heavy-gauge rust-resistant 5.5-inch springs that ensure superior bounce. Now that we have discussed everything there is to learn about the best and safest trampolines, it is now up to you to decide which one is a great bang for your buck. While these trampolines all come with outstanding features, we are sure that you will now be able to narrow down your choices into choosing only the best.